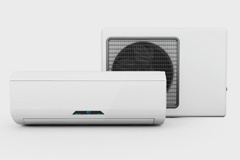 There are many reasons you might elect to install a ductless, mini-split air conditioner in your home. These systems are commonly installed as add-ons in homes with non-ducted heating systems, or in multifamily housing. They can also be installed in additions or small apartments when adding on to the current duct work is unrealistic in some way. There are two main components to a mini-split system: an outdoor condenser, and an indoor air-handling unit. These two units are linked together with a conduit. What are the benefits of mini-splits? In terms of flexibility, mini-splits are your best bet. These cooling systems are quite small and are able to cool individual rooms. Some systems have as many as four air-handling units, meaning that there are as many as four rooms behind cooled by one mini-split system. The number of air-handling units needed is dependent on the size of the building and how much cooling is needed (which will also vary according to insulation level). Additionally, mini-splits offer flexibility in terms of interior design. Indoor air-handling units can be mounted or suspended from the ceiling or hung on a wall. There are also floor-standing models of the indoor units. Most often, these units are about seven inches deep and come in high-tech, sleek-looking jackets. There are also many models that come with a remote control so that you can easily turn the system on and off, regardless of where it is in the room. 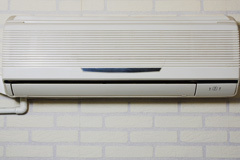 It is also often easier to install ductless mini-split AC systems. In general, there is only a three-inch hole required to hook up between the indoor and outdoor units, and most systems come with a cariety of conduit lengths. This means that the indoor and outdoor unit can be as much as 50 feet away from each other. This means that you can put your outdoor unit in another, inconspicuous place, like the back of the building, while cooling a room in the front of the building. As mini-split systems are ductless, they don’t face the same issues of central forced air systems, which lose energy due to ductwork. These losses can account for more than 30 percent of energy consumption when it comes to air conditioning, especially if the ducts are located in a hot space, such as the attic. Additionally, each zone has its own independent thermostat so that you only need to condition the air of the space when someone is the zone, which saves on energy costs. Ductless, mini-split AC systems are also a safer option for your home because there is only a 3-inch hole in the wall to run the conduit between the indoor and outdoor systems. Sometimes, window-mounted or through-the-wall AC systems allow intruders to crawl through them; this isn’t a concern with mini-split systems. If you are interested in having a ductless, mini-split air conditioning system installed in your home, contact Lamco Systems. We are proud to provide superior air conditioning services to the Boston area. Call us today for a free consultation!